SACRAMENTO, Calif. (CN) – Greenlighting partial funding for a series of dams that would be the largest built in California in decades, state regulators on Tuesday dished out over $2.5 billion for new water infrastructure projects. The proposals would boost California’s ever-dwindling above and below ground water supply. 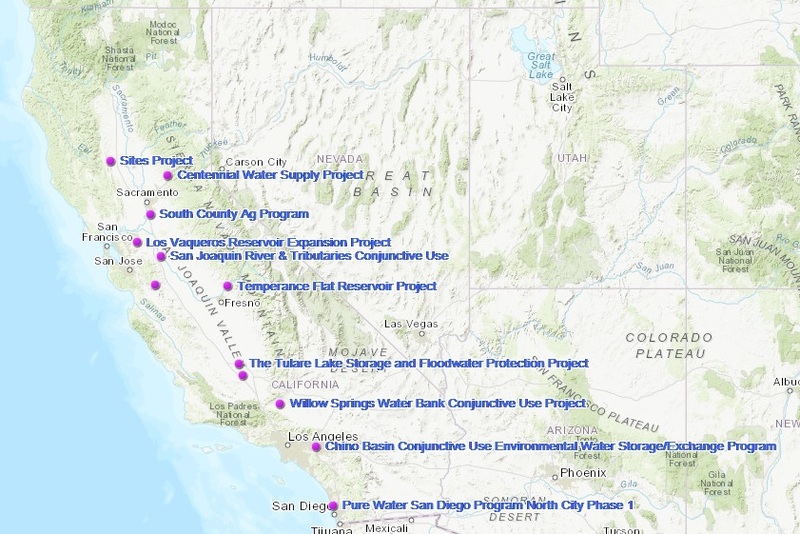 The taxpayer-funded projects include massive multibillion-dollar new dams as well as recycling and groundwater recharge systems up and down the Golden State. The new dams would add millions of acre-feet in water storage, specifically massive projects in Northern and Central California. California boasts some of the nation’s tallest dams with Oroville and Shasta and its largest ones were all built before 1980. With nearly 40 million residents and an expansive agriculture industry, statewide water shortages are never more than a dry winter or two away. The largest piece of the taxpayer pie will go to the Sites Project north of Sacramento. The California Water Commission agreed to dedicate over $800 million to Sites, which could trap approximately 1.8 million acre-feet of water in the foothills of the California Coast Range. Sites would be an “off-stream” project, with most of its water coming indirectly from the state’s largest river, the Sacramento. The mammoth $5.1 billion project would become California’s seventh largest reservoir and could be completed by 2030. Commissioner Daniel Curtin said Sites provides the “best return” of the three proposals ranked in the second public benefit tier. He added that Sites should be given additional funding if other projects don’t pass financial or environmental muster and are shuttered. “It is part of what I think our original charge was, to improve the operations of the state water system. I think that as good as these other projects are, they are tiny, I mean tiny, compared to Sites,” Curtin said. Other big winners included expansion projects at two San Francisco Bay Area reservoirs. Nearly $500 million will go toward a new dam for Pacheco Reservoir in Santa Clara County. The 319-foot dam would increase the reservoir’s storage from 6,000 acre-feet to 140,000 acre-feet at a cost of $969 million. The infrastructure boom will also stretch to Contra Costa County, with $459 million going to raise the height of Los Vaqueros Dam. But the regulator wasn’t as generous to backers of the proposed Temperance Flat reservoir near Fresno, despite it being ranked above Sites in terms of public benefit score. Commissioners will fund just $171 million of the project’s $2.6 billion estimated price tag. The California Water Commission’s decision to partially fund eight water projects caps over three years of often contentious negotiations between proponents and the unelected regulatory body. Gov. Jerry Brown appointed the nine-member board. Lawmakers and critics accused the commission of stalling funds earmarked for new water projects by overscrutinizing the proposals. Staffers and commissioners graded the projects in three categories: relative environmental value, resilience and implementation risk. Republican State Sen. Jim Nielsen at a public hearing in February told the commission it had lost the public’s trust. “They already feel betrayed with the four-year delay,” Nielsen said. Yet the commission said it simply following the specific process enacted by voters in 2014 through Proposition 1. Voters wanted the state to consider the environmental impacts of new water storage projects before doling out the $2.7 billion in bonds. The measure, which did not earmark funding for any specific project, requires the commission to consider more than just water storage capabilities. Applicants had to prove their water projects would provide things like improved flood control and wildlife habitat. Proposition 1 cash doesn’t guarantee the eight projects will move forward as the proponents – mostly water districts and agricultural interests – will have to secure large chunks of local and federal funding along with environmental permitting. Proponents must submit regular status updates and final environmental reports by January 2022. The commission’s long-awaited decision to spur water infrastructure improvements comes as another state regulator mulls a proposal to reduce the amount of water available to Central Valley farmers and cities. Hoping to protect struggling salmon and other wildlife, California’s water board wants to require water districts to take less water from the Stanislaus, Merced and Tuolumne rivers. The regulations would mandate higher flow rates during times of the year to benefit salmon and trout populations. Water districts vow to fight the water board’s proposed regulations, while environmentalists want even stricter flow mandates. Water board chair Felicia Marcus says the river flow requirements are nine years in the making and critical due to the stunning decline in fall-run Chinook salmon. Just 8,000 salmon returned to the Sacramento-San Joaquin River Delta in 2014, down from approximately 40,000 in 2010. The water board is taking public comment on the latest flow requirements with hearings scheduled for Aug. 21 and 22.